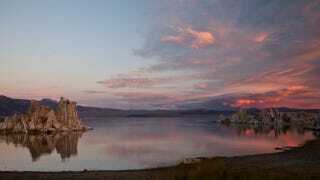 In late 2010, NASA scientists announced the discovery of microbes in California's Mono Lake that used arsenic instead of phosphorus in their DNA. The study quickly came under intense criticism — and now we may be about to refute it entirely. If the initial findings had held up, this would have greatly expanded the possible forms that life could take and potentially had a big impact on the search for life elsewhere in the universe. That, unfortunately, has proven to be one gargantuan "if", as the team's Science paper has come under heavy scrutiny and received numerous technical comments. Most of these comments have argued that, rather than actually using arsenic in its biochemistry, the microbes are simply subsisting off of whatever minute pieces of phosphate they can while enduring the arsenic toxicity — itself a remarkable feat of survival, but not earth-shattering in the way that arsenic-based life would be. And now a team of microbiologists at the University of British Columbia have attempted to replicate the original findings that pointed to the existence of arsenic-based microbes. According to preliminary data published by team leader Rosie Redfield, their results represent "a clear refutation" of the NASA study. Redfield grew GFAJ-1 bacteria in arsenic and a very small amount of phosphorus, as had Wolfe-Simon and her colleagues. She then purified the DNA from the cells and sent it to Marshall Louis Reaves, a graduate student at Princeton University in New Jersey. Reaves used a caesium chloride gradient to separate the cells' DNA into fractions of varying densities, then used a mass spectrometer to identify the elements present in each fraction of DNA. He found no arsenic in any of the DNA. But Redfield's methods might leave defenders of the arsenic life hypothesis some wiggle room. For instance, Redfield was unable to grow any cells without adding a small amount of phosphorus. Because it is not clear how much phosphorus was used to grow the bacteria in the original paper, its authors could argue that Redfield's cells were not sufficiently phosphorus-starved to be forced to use arsenic in its place. That technicality might be enough to keep the debate going on the possibilities of arsenic-based life. But right now, the evidence is piling up against the original study, and we're likely going to need to see some extraordinary new evidence for arsenic-based life to be taken seriously going forward. Read more at Scientific American. Image by MikeBaird on Flickr.